Nicola has a remarkable CV- which includes Isidingo (local South African soap opera) from 1998-2001 and many other local & international films. Nominated for best female actress in comedy TV Series (with ZAnews SA TV Comedy of 2014 & 2015), namely for her characterisations of Helen Zille, Sarah Palin, Lady Gaga & Charlize Theron. This amazing character and unique story-telling show – is now also a book and audiobook. I originally launched the theatre show in 2012 – was nominated for a South African Naledi award in 2014 – for best show for youth and children. I am very pleased to say that her story has currently reached over 15 000ppl around Africa, and is currently gathering international interest. The LooneyVerse is an Ultraviolet experience of spoken-word, poetic guidance and humorous interactive theatre. I launched LooneyVerse in 2017 and you can only see this remarkable character in the Pop Up Theatre (normally at festivals round Southern Africa). I love accents and characters and animation – so I’m often in my home studio throwing out a voice for commercials, animation, games and or documentaries – for samples of my voice work – please click above. 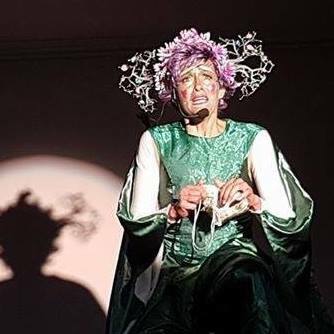 I love to take theatre to unexpected places and so I’ve been taking my shows, and friends shows, to festivals around Southern Africa – give us a shout if you’d like the Pop Up Theatre at your next rad event.